My wife is really quite a special lady. She has to be, to put up with me. However, even special ladies can occasionally drift dangerously close to stereotypical behaviour. For example, my wife is addicted to purchasing shoes and handbags. I would complain, but when you have almost 200 board games stuffed on your shelves, you don't have a huge amount of wiggle room (metaphorically or physically) for arguing about that sort of addiction. In fact, my wife is addicted to purchasing clothes in general, and hardly a week goes by when she doesn't pack something else into her overflowing wardrobe. As for me, I am far less special, and far more likely to fall into stereotypical male behaviour, particularly when it comes to clothes shopping. If I need to buy a new pair of jeans, I grab something with two legs and head for the closest counter to pay. The thought of spending more than five or ten minutes picking clothes fills me with the kind of dread people usually reserve for using the portable toilets at an outdoor festival. Recently, my wife purchased a new top. I don't remember what it was like. She asked me if I liked it, and I said, "Yes, it really suits you," because I'm well trained and value my testicles, but I didn't actually look at it. I couldn't describe it to you. I only remember this top because my wife really loved it, but then never wore it. The problem was, she could never find anything that went with it. On its own, in theory, the top was everything she could have wanted. However, no matter what shoes, handbags, trousers, skirts, or scarves she wore with it, the resulting ensemble was wrong. 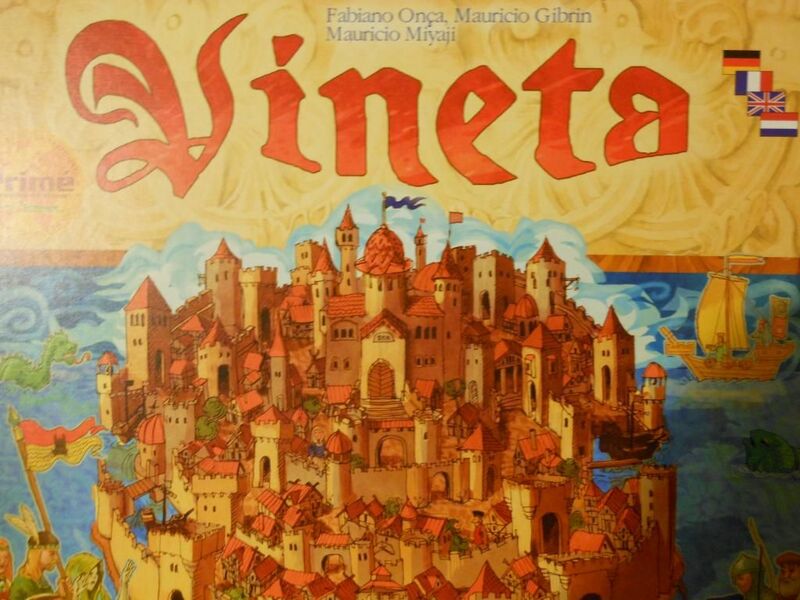 That's very similar to my experience with Vineta, a game that looked great, sounded great, and was theoretically a good match for my gaming group; yet which was ultimately a game I had to get rid of because no matter how many people I played with, the result was always a bit of a damp squib. The rules... All seems clear enough. The premise of Vineta is simple. In fact, it's almost elegant, which is a word reviewers like me use in an attempt to make our hobby sound more interesting when we are talking about very simple games. And Vineta really is a very simple game. I mean, we're talking similar complexity level to the plot line for an episode of Dora the Explorer. But simplicity does not go hand in hand with dull, chaotic, strategy-light mechanisms. It's like my daddy never said, "Paddling pools seem shallow, but they usually have a few feet in them." The board before the island pieces are added (or after they have sunk). 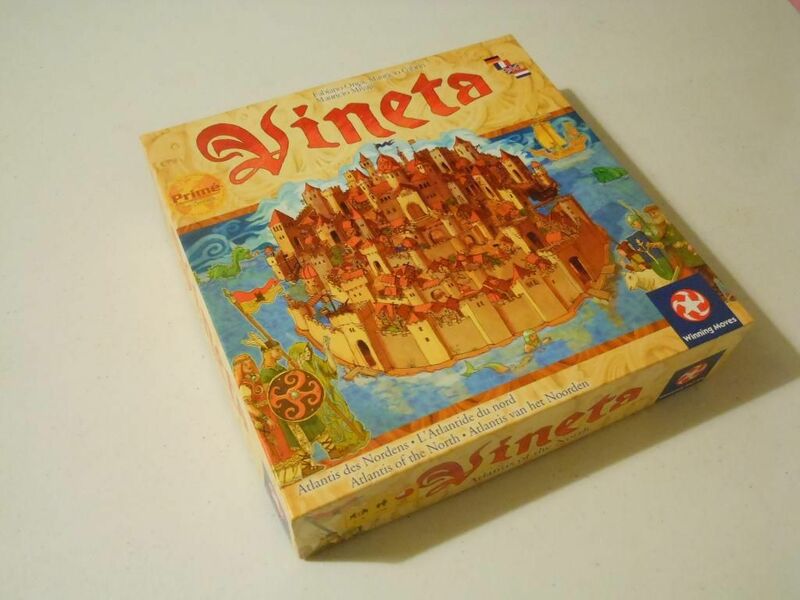 In Vineta, each player is a god who has decided to sink the titular island. You know how gods can get, sometimes. However, each god has taken pity on a particular group of islanders. So, over the course of the game, each player is trying to sink parts of the island to drown certain people, while at the same time trying to keep other areas of the island above water level. 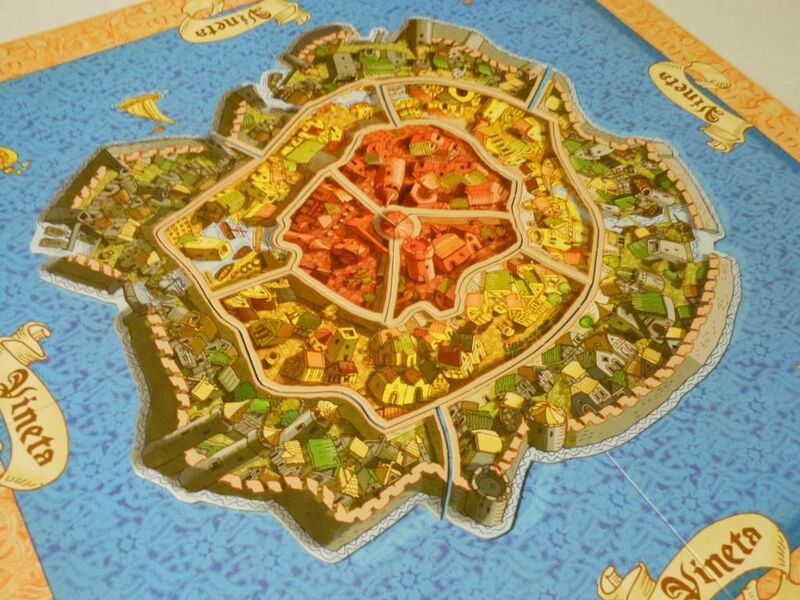 The island itself is composed of nine jigsaw pieces, and at the start of the game, each player allocates houses of different colours to each region. 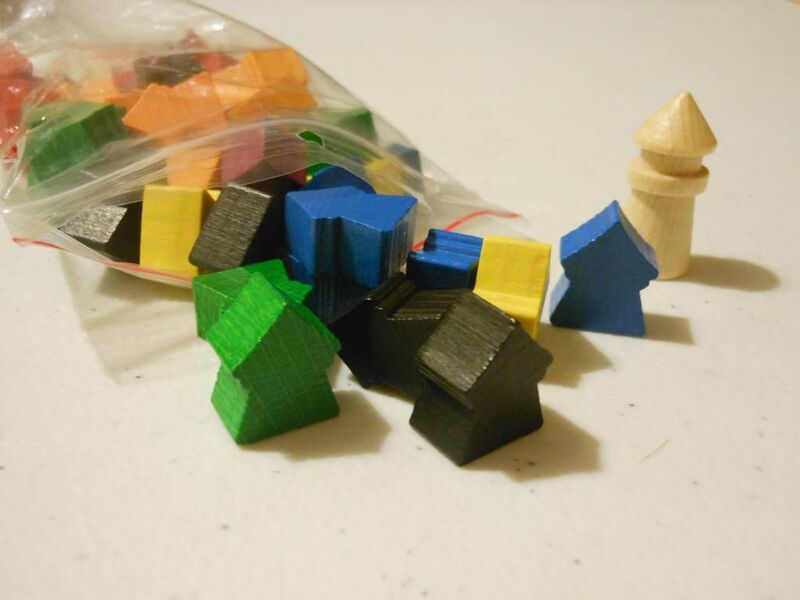 Secretly, each player is allocated one region he or she wants to keep afloat, and one colour of houses to save. The island of Vineta... There's a storm coming. Play then proceeds in rounds, with players playing cards from their hand to achieve different results. Many of the cards are tidal waves. 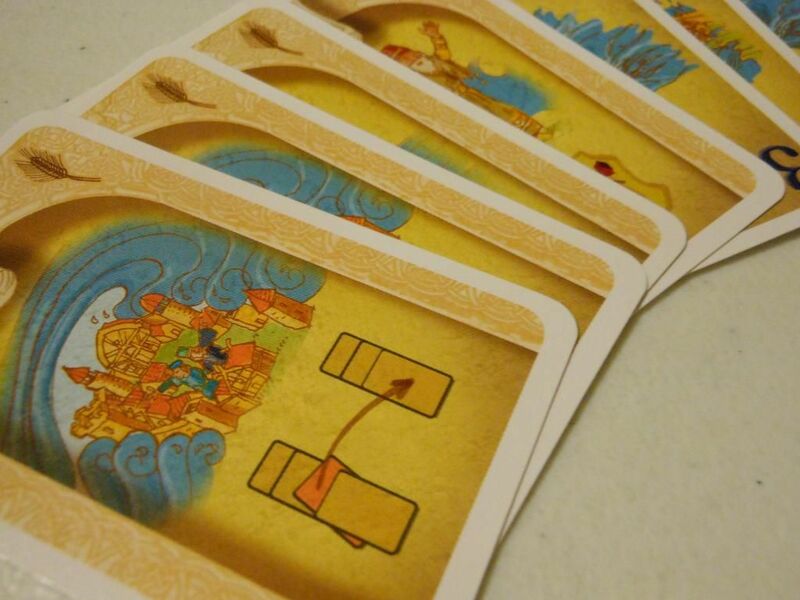 Players select an area to flood on the island, and then they start to add tidal wave cards. At the end of the round, the region that got hit by the most water is removed from play, along with any houses that were on it. These houses are divided out among the players who helped to sink the region, and translate into points at the end of the game. However, there are lots of other cards that have different abilities. Some allow you to transfer houses from a flooding region to a safe region, some allow you to swap the locations of houses, some allow you to push houses into danger. If you love drowning people, or saving some people so they can watch while you drown other people, then you're in for a great time. In theory, it all sounds okay. The presentation is lovely: You have a beautifully illustrated island, full of cute wooden houses, and decks of cards that shuffle like Frank Sinatra sings. Look at all the cute houses you get to flood. The theory behind the game is just as slick. Through careful hand management, bluffing, and a bit of negotiation with other players, you have to flood areas containing houses you don't want to save, while trying to prevent other players from sinking your bit of the island and all of your houses. 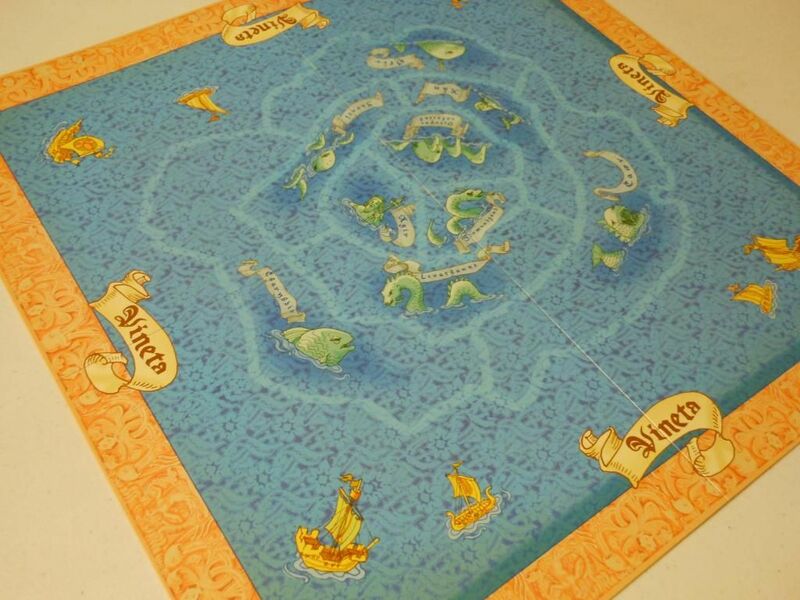 Then, at the end of the game you get awarded points for every house you sank and every house you were trying to protect that is still standing, plus a bonus if the only piece of the island remaining is the piece you were secretly allocated at the start of the game. 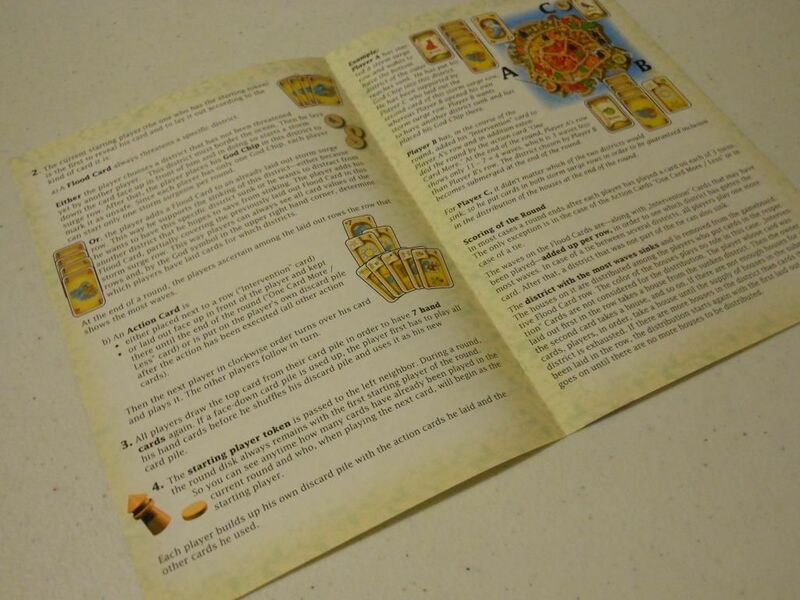 First of all, the game includes a crib sheet to explain the actions on the special cards, and it is totally wrong. That almost sank my first game due to the levels of confusion resulting from icons on cards that did not match up with the explanation of what those cards did. Still, I got over that by printing off new sheets that I found on BoardGameGeek. The second problem is the random allocation of island pieces that each player needs to save. During the game, you can only attempt to sink an island piece that is on the outside edge of the island, so for the first few rounds the inside pieces of the island are totally safe. If you get allocated an outside edge to protect, chances are you are not going to be able to save it, as it is a prime target for sinking, while if you get an inside piece, your chances of getting bonus points are much higher. Okay, inside pieces are worth less points, but some points are generally better than no points, and this is a random element of the game that can screw you over before you even get started. But, like I said earlier, this game has an even bigger issue: It's no bloody fun no matter how many people you play with. The cards... You may as well play them randomly for all the good they do. Play it with two people, and for most of the game there is very little interaction. Each player tries to sink different bits of the island with little interference from his or her opponent. If one player does attempt to prevent the other player from sinking a location, it is a massive giveaway that the location in question is one that the player needs to keep safe, which blows the bluffing element of the game right out of the water. Play with three players, and mechanisms that could have been fun start to seem a bit fishy. The biggest issue is that if you attempt to prevent a location from sinking, the other two players immediately realise you want to save it and gang up on you. In this situation it is impossible to save the location. Pretending to save a location you don't actually need doesn't work either, because you end up wasting cards that you really want to use elsewhere. Basically, if one of the players randomly selects to attack the region you want to save, there really is very little you can do about it. Now, if you play with even more players you will really start to get a sinking feeling. With four players, the game turns into complete chaos. You have no chance to save a location. If you move houses out of danger, someone else will probably move them right back. If you play a card, someone else will cancel it in some way. You cannot predict what will happen because there are so many cards getting thrown into the mix. You feel like you have no control over anything. Add a fifth or sixth player, and it really is just an exercise in flipping cards and hoping for the best. Ultimately, I feel it doesn't really matter what you do. It's a shame. All the pieces are there for what should be a really good game, but it just doesn't hinge together. It isn't deep enough to give you the options for clever bluffing and card play. It isn't shallow enough to be a light filler. It is a frustrating mix of random chance and "take that," which is about as much fun as it sounds. I am sure some people will enjoy this, and some people will say I am wrong and that it is not as random as it seems; but there are better bluffing games, and better secret role games, and better... games. Just better games. So, I had to wave goodbye to this one. And now it sleeps with the fishes.